Neustar has successfully reinvented itself over the past several years – from being primarily known for its role as a neutral and authoritative provider of telecom numbering services to CSPs in the United States to its current incarnation as a leading provider of full-service marketing analytics and customer intelligence data services. Its lead business delivers to brands and marketers the technology stack and smarts to enable new levels of customer understanding and targeting. Over the years, anticipating the wholesale move to IP networks, Neustar has also built up its IT security and identity management services, including managed DDoS and managed DNS registry services. While its focus on the Internet of Things (IoT) is still a relatively new development, the company has enviable foundational elements and new capabilities in the works that could prove valuable on the road from the current environment of IoT silos to future enablement of massively scaled IoT systems. 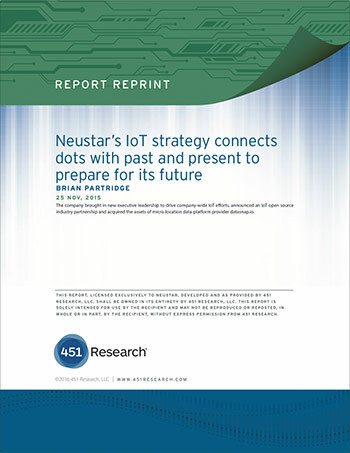 Neustar seeks to establish a meaningful (and profitable) role as IoT progresses from its vertically integrated and proprietary-application beginnings to its endgame, where systems are built to scale horizontally, using Internet standards, to support massive device diversity and volumes, with cross-application, cloud, and vertical market data exchange and insight creation in mind. These large-scale IoT systems will depend on much of the supporting infrastructure and standards that today’s Internet services require. Neustar is adept at managing neutral, authoritative and massively scaled identity registry services. The key for Neustar is to align with the right partners on the device, cloud and systems-integration fronts while selectively driving industry standards bodies in its direction. Additionally, Neustar’s role as an end-to-end provider of services in support of customer intelligence, targeting, and analytics to brands and their marketing partners also sets it up nicely to bring IoT-enabled value directly to retailers and marketers. In this area, it will couple existing assets with the capabilities it has recently added in areas such as micro-location services. Neustar was founded in 1998, and is headquartered in Sterling, Virginia. The company was born as a spin off of Lockheed Martin, which at the time was providing telephone numbering registry services to US telecom service providers, and needed to more overtly support a position of neutrality, hence the company’s name. After a long and ongoing process involving several protestations from Neustar and interested third parties on the overall fairness of the contractual process, the North American Numbering Council advised the FCC to award the next NPAC contract to competitor Ericsson. While this result was disappointing for Neustar, and brings a painful revenue loss eventuality (~50%), it also accelerates the long-awaited transformation of Neustar into a data and information services market leader. To the credit of executive management, the company invested aggressively to accelerate its transformation, picking up segment leaders TARGUSinfo, Aggregate Knowledge and MarketShare to support its revenue-diversification goal. In anticipation of the transition from PSTN to IP networks and services, Neustar has also been augmenting its telephony numbering business with IP services, including its managed DNS services; top-level domain registries; and managed DDoS protection, website performance and fraud-detection services. With IoT, Neustar anticipates a future that could make use of its existing capabilities as an authoritative registry – as a provider of data management and analytics services, and backed by its reputation for neutrality – to support a number of industries and use cases. Operationalizing this vision will require deft partnering, investments and product positioning – the IoT still faces significant adoption hurdles, many of which go beyond the myriad technical challenges and are more fundamentally rooted in challenges with business process, cultural changes and ROI. A combination of elements that will set the path for the long-term role for Neustar in IoT is quickly moving forward. This effort began in earnest with the hire of Hank Skorny as Neustar’s SVP of IoT. Skorny came to Neustar from Intel, where he was directly involved in establishing the IoT strategy in Intel’s software and services group, including driving the formation of the founding set of industry partners that later became the Industrial Internet Consortium. He brings professional leadership experience that aligns with IoT from his 35 years in the industry, spanning software development, computational modeling, and pre-IoT connected asset system design and development. At Neustar, Skorny anticipates building a dedicated team and establishing a horizontal enablement role for Neustar as a neutral, authoritative IoT device registry of record for a diverse set of device types across several industries, to go with selective pursuit of end-to-end offerings in key verticals, such as retail, where it has the assets and brand to win and align with the company’s current strategy in customer intelligence. The high-level vision is that Neustar’s role as a neutral and trusted provider of addressing and IDM for the Internet will lend itself well to IoT, at potentially much larger scale and complexity (e.g., many of the ‘things’ in IoT deployments will not actually have IP addresses, and will require augmented models). Neustar would also be able to apply its expertise and services around DDoS detection and mitigation to protect critical IoT servers, devices and systems. The company believes it would serve as a direct service provider to enterprises or, even more likely, as an enabling technology provider behind major networking infrastructure vendors such as Dell or Cisco, industrial automation companies, cloud infrastructure providers, device OEMs and large-scale systems integrators. Skorny believes that open source software innovations such as Hadoop and Apache will have a major role in IoT, and is actively positioning Neustar as a driver of this effort on a number of levels, including communications, cloud and applications. As a first step in commercial support of this direction, the company recently announced a collaboration with enterprise Hadoop software leader Hortonworks that will focus on establishing a device-registry catalog; providing code for multi-factor authentication and authorization; data governance via integration between Apache NiFi (open source for data-flow orchestration) and Apache Atlas (for Hadoop data governance); and data analytics, which will be achieved by integrating Apache NiFi with Neustar discovery, registry, identity, and policy platform services. The company has long been an active contributor to the Internet standards bodies, and will actively contribute to IETF and W3C standards work to support IoT. The competition for IoT identity and access management (IAM) is currently as fragmented as the actual end markets. To date, companies building connected products have been using ‘human-centric’ IAM, which is both expensive and not designed for massive scale and device-type diversity. Alternatively, an external IoT platform delivered from a hardware maker or from a PaaS vendor may be handling IAM using proprietary techniques or protocols running on agent software. Another approach is to design IAM in hardware – for example, Intel’s newly announced Enhanced Privacy ID. The bottom-line is that the mechanisms best suited for IoT device-identity management, authentication, discovery and security are still in active debate. In the absence of fully formed offerings and ecosystem build-out from Neustar, it’s still too early to draw direct competitive comparisons, although we expect DNS providers such as Verisign to be active in the market. Verisign has been actively positioning the DANE (DNS-based Authentication of Named Entities) protocol as a way forward for securely scaling IoT. We also expect Internet performance service providers such as Dyn, Akamai and Amazon to compete in this segment. Device discovery and authentication have also been incorporated into open source projects such as the Open Interconnect Consortium IoTivity reference architecture. Neustar will need to clearly articulate where, why and how an authoritative external provider of IAM fits in to support a strong business case while filing the relevant technical gaps where Internet technologies such as DNS are not a good ft for IoT without augmentation. In the segment for marketing/customer intelligence services, Oracle is Neustar’s main competitor. Both vendors have a similar vision of providing the data tools and services to link identity across multiple marketing and advertising channels. Oracle, like Neustar, is also investing in the application of IoT into retail and marketing segments, although it has not announced a direct play in support of micro-location services.